I love Lexmark multifunction printers. I have a small office in my home and I do mean small. Instead of having separate components - color printer, color copier and scanner - I can get all of them in one machine. 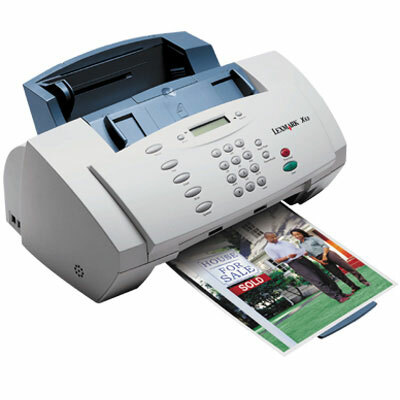 And now Lexmark has made it even better by offering their latest with fax capability as well! I got the Lexmark X83 primarily for the thermal printing - instead of having to wait for the ink to dry, like you do with typical inkjet printers, thermal printing means the ink is dry as the paper comes out. No smudging, no waiting, no fuss. And the quality seems to be much better than most other inkjets (at least to me). With a 2400x1200 dpi resolution, I get up to 12 pages per minute (black and white) and 6 pages per minute for color. Scanning is just as nice - it's a 48 bit flat-bed scanner and allows me to scan pages from books, reports, magazines and more. The best part is the color copy function (I don't use the black and white as I do have to admit I have a regular old Xerox copier). I can get up to 3 copies a minute in glorious color and I do mean glorious. The X83 can be connected to your desktop (or laptop) via USB so that you can print, scan and copy from the computer or send faxes via the included on the CD-ROM that comes with it. However, you can't do just regular faxes (which means manually). That's where the X63 comes in. The Lexmark X63 is about half the height of the X83, making it appear more compact, although it basically takes up the same amount of space. Both cost the same, $199.95 (retail) and both have the same 2400x1200 dpi resolution. It is NOT a flatbed, so any copies or scans you make must be able to go through the document feeder. If you have a book or a magazine, you're out of luck. But if you scan or copy one piece of paper at a time (or a photo), then the X63 is for you. But it's the fax capability of the X63 that makes it stand out gives you more room on your desk when you get rid of your old fax machine. You can't beat that. 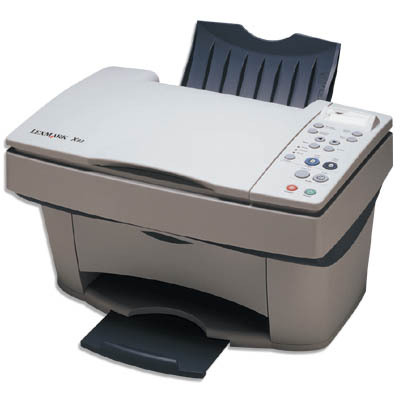 The X63 works just like a regular fax: Place the document facedown in the document feeder, punch in the fax number and hit send; or use your computer to send faxes, just like the X83. Now I had myself in a quandary. I like the flatbed on the X83, since I do scan a lot of odd-sized things, such as pages in books, magazines, etc; but I love the fax capability of the X63. So I compromised. I kept the X83 in my office and put the X63 in my husband's. He doesn't do as much scanning and copying as I do, but finds the X63 is perfect for him. When I need to send a fax, I pop into his office and off it goes. I get more room on my desk, he gets a multifunction printer/scanner/copier/fax and more room on his desk and we're both happy. Now, if only Lexmark would come out with a multifunction printer/scanner/copier/fax that has a flatbed. . .then I'd be ecstatic.